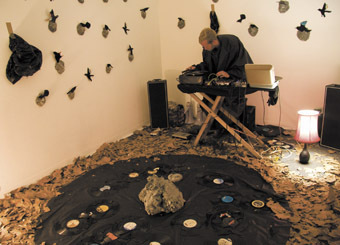 LIQUID ARCHITECTURE SEASONS TYPICALLY REVEAL NEW DIMENSIONS OF SOUND, AS WELL AS INVESTIGATING THEIR IMPACT ON THE LISTENER. WHAT WAS STRIKING THIS YEAR WAS THE DIVERGENCE IN THE LISTENING ENVIRONMENTS AND THEIR EFFECT ON THE RECEPTION OF THE WORK. WE WERE VARIOUSLY IMMERSED IN THE MELBOURNE PLANETARIUM, THE REVERBERANT CELLS OF THE OLD MELBOURNE GAOL AND A WEST SPACE ART GALLERY INSTALLATION, SPLITTING THE AUDIENCE’S AWARENESS BETWEEN SONIC AND VISUAL CUES. AS WELL, THERE WAS THE TYPICAL ARRANGEMENT OF THE MAIN CONCERT VENUE, THE NORTH MELBOURNE TOWN HALL, TO LOCATE LISTENERS INSIDE A CIRCLE OF LOUDSPEAKERS TO EMPHASISE THE SPATIAL MANIPULATION OF THE SOUND. Immersion, a concert of high-quality recordings by prominent sound artists, curated by Phillip Samartzis, was located in the Planetarium, an interesting location for sound art. You lie back in a reclining armchair, as you might at home, and enjoy the recordings on the excellent speaker system in a detached and inward way. While listening, you could watch an outer-spacescape, but since this imagery has nothing to do with the music, it is better to close your eyes and focus on the sound. The session included Berlin composer Rhienhold Friedl’s fascinating eight-channel work Neo-Bechstein (undated), which employs an electro-acoustic piano built by Bechstein, Siemens and Telefunken in 1930. The ringing tones of the piano, beautifully mixed and spatialised, are hypnotic in such a setting. This highly structured experience, a kind of aural cinema, contrasted vividly with the stark and emotionally challenging site of the Old Melbourne Gaol, where Within Earshot offered a showcase of multimedia works in cells through which the audience could wander, followed by a concert of four performances in the gaol’s exercise yard. The theme of the event was the idea of displacement, and the works in the cells made good use of the gaol’s resonance, dynamics and social history. In the concert, Melbourne sound artist Que Nguyen’s complex and engaging vocal and electronic work (untitled), with its hints of creaking doors, ghostly cries and clanking metal, stood out. Vacuum #1 at West Space Gallery, curated by Eamon Sprod and Camilla Hannan, was a group production that ran for several hours each day over four days, with many local and visiting performers sitting in, and with the public invited to contribute. The sound, generally laptop and synthesiser driven, evolved continuously, and was relayed through numerous sets of speakers: wall-mounted, floor-mounted and some within lengths of tubing suspended at ear-level. Generally lacking the resolution of a compositional beginning, middle and end, this sound art seems intended as an exploration of group improvisation and spatial and acoustic dynamics, as well as challenging the usual performer-audience hierarchy. Audience members meandered around the gallery’s spaces and speakers for minutes or hours at a time, or found a convenient corner to sit—what you get out of such unstructured activity depends on what you put into it. The transaction between audience and performers is different in the concert hall. For the events in the more conventional environment of the North Melbourne Town Hall, LA9 artistic director Nat Bates brought together major Australian and international performers who typically sat studiously at keyboards and laptops, though it is not always easy to tell how much of what is heard is pre-programmed and how much is improvised or spontaneous. These concerts included a thorough exploration of the genre of electronic music that both manipulates sound in space and provokes and unsettles the mind. Berlin composer Marcus Schmickler’s overwhelming orchestration of electronic sound, emphasising spatial effects, was at a volume that obliged the audience to resort to the earplugs offered on entry. The flavour is dark, alternately bellowing and brooding, with dense, contrasting textures, sweeping shifts in pitch and long tones with no discernible rhythmic structure. The Thursday night North Melbourne audience responded strongly to Schmickler’s lengthy, dramatic and adrenaline-pumping performance, which was nicely complemented by Sydney sound artist Alex White’s wailing, fraught and overdriven sound and Nat Bates’ own powerful and highly crafted composition. The work of Schmickler, White, Bates and many others produces its effect through a high quality and very robust multi-channel speaker system in a large space, a space that emphasises the cerebral nature of the work, forcing your awareness inward and even engendering feelings of isolation. By contrast, the Sydney-Melbourne instrumental/ electronic ensemble Metalog’s absorbing improvisation was an intimate affair. The audience was seated around the musicians and the sound came both from behind and in front, locating you in a unique aural space. Metalog’s engaging and physical live performance added an essential dimension to its music.